This morning we woke up bright and early for a tour at the Monsanto cotton facility in Cañas before making our way to Papagayo. We learned that Monsanto is as much a research facility as it is a production facility, working with genetically engineered cotton plants in an effort or breed crops that are more resistant to insects and other adverse conditions. Compared to many of our American companies back home in NC, the Monsanto facilities were very simple, consisting of three main buildings containing one large cotton gin, machinery to clean and dry the seeds, and smaller gins used for samples of seeds to be genetically tested. We were able to see the bales of cotton before and after it was separated, and gained a greater appreciation for a material so common in things we use and wear daily! 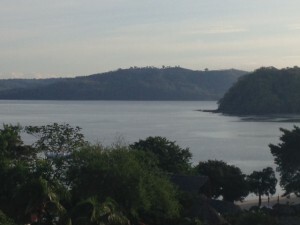 After a stop in downtown Papagayo for lunch and some shopping, we checked I’m at the beautiful Hilton Papagayo Costa Rica Resort and Spa, located directly on a s heltered bay on the Pacific Ocean. We enjoyed the beach, pool, snack bar, and buffet as we spent our last night in Costa Rica. It was a relaxing evening to reflect and enjoy each other’s company one last time before we say goodbye in the morning after our flight back home. It has been a wonderful trip filled with learning experiences, laughs, and memories, and even though our journey to Costa Rica has come to a close, we will all carry a piece of this beautiful country with us for the rest of our lives. As the locals say, ¡Pura Vida!